Off the northern coast of San Francisco, California near Fisherman's Wharf. Did you know: Alcatraz was initially a lighthouse and fort. Did you know: the Birdman of Alcatraz actually existed - he was inmate Robert Stroud who studied small birds. In 1775 Spanish explorer Juan Manuel de Ayala charted the San Francisco Bay, and the small island La Isla de los Alcatraces, ("Island of the Pelicans" ).The island was abandoned due to swift currents, little vegetation, and rocky ground. Recognized for its strategic military location in the mid 1800s, Alcatraz became the first lighthouse and fort on the West Coast of the United States. 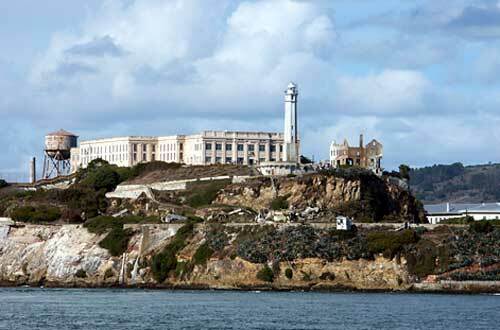 Later nicknamed "The Rock", its history as a Federal prison gained it fame and notoriety. Originally declared a military reservation by President Millard Fillmore in 1850, U.S. troops were garrisoned there beginning in 1859 for the defense of the Bay Area of San Francisco.